Marvel’s Civil War II: Choosing Sides anthology is the best thing to come out of the Civil War II event, bringing in exciting new and established talents to tell short stories about a wide range of Marvel Universe characters. The miniseries ends with next week’s Choosing Sides #6, and the issue features some truly inspired creative pairings. 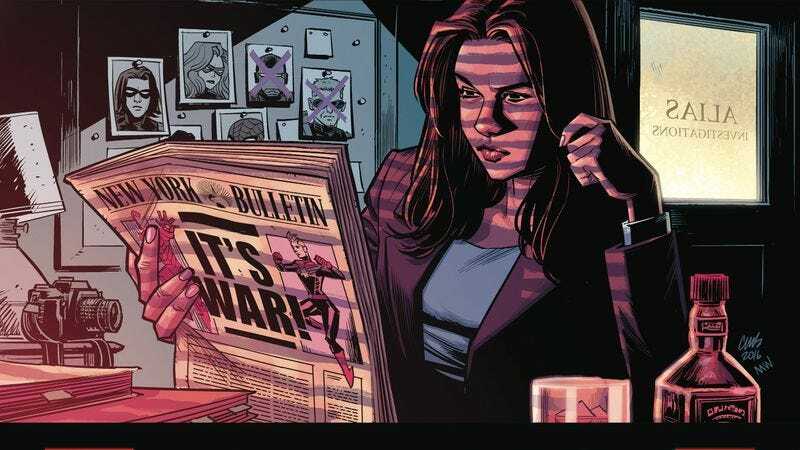 Writer Chelsea Cain, artist Allison Sampson, and colorist Jordie Bellaire tackle Jessica Jones, marking the first time a creative team of women has been in control of the character, and these preview pages are full of humor, style, and atmosphere. Cain’s work on Mockingbird has made her a major talent to watch, and Sampson and Bellaire are an exceptional art team, with Sampson’s scratchy, detailed linework adding grit to the story while Bellaire’s evocative coloring draws readers deeper into the southern Ohio setting. Christina Strain is best known for her work as a colorist on books like Runaways and Spider-Man Loves Mary Jane, but she began writing her own comics (specifically the webcomic The Fox Sister) after leaving Marvel. She makes her return to the publisher with a tale of the White Fox, partnering with Monstress’ Sana Takeda to explore where Marvel’s South Korean superheroine fits into Civil War II. Humor, style, and atmosphere are once again the defining elements in these preview pages, but Strain and Takeda take different approaches to all three. Setting the opening conversation in South Korea’s “sheep café” (which is a real place) introduces comedy to the tense conversation, and Takeda’s art has a bold manga style and makes the different environments feel distinct as the setting moves from the café to the roof of the National Intelligence Service Headquarters. The final piece in Choosing Sides #6 is the conclusion of writer/artist Declan Shalvey and Bellaire’s Nick Fury story, which has been serialized across all six issues. Shalvey has had a lot of fun taking the reins of a suspenseful spy yarn for his first big writing gig, and as always, his frequent collaborator Bellaire brings out the best in his artwork. Readers should check out Choosing Sides even if Civil War II has turned them off, and hopefully some of these shorts will grow to become bigger projects because there’s been a lot of promise in these pages.